Remote Mount Fubilan, near the source of Papua New Guinea’s Tedi River, is once again the site of global controversy surrounding the Ok Tedi copper gold mine. Since the late 1980s, Ok Tedi has symbolised the David and Goliath struggle between major multinational miners, remote developing communities and the environment. Ok Tedi resumed the spotlight in recent weeks when the Papua New Guinean Parliament removed former mine operator BHP Billiton’s immunity from legal prosecution for environmental damages caused. On 19 September, PNG Prime Minister Peter O’Neill led Parliamentary actions to pass a bill allowing the Papua New Guinean Government to take complete ownership of the Ok Tedi Mine. In a separate bill passed at the same time, new legislation removed BHP Billiton’s immunity from legal action for environmental damage caused by the mine’s operations. BHP Billiton’s legal immunity arose through a 2001 agreement in which the company voluntarily divested its interests in Ok Tedi, placing its majority shareholding into a charitable trust, the PNG Sustainable Development Program (PNGSDP). The Program held 63.4% ownership of the mine, with the PNG Government holding the remainder. This recent legislation transfers full ownership to the PNG state and removes that agreed immunity. The environmental damage caused by the Ok Tedi mine is extensive and, many scientists argue, likely to be irreversible. During the 1980s and 1990s, the mine dumped an estimated 80,000 tonnes of limestone sludge, containing chemicals and minerals, into the upper Tedi River. A 1984 effort to build a tailings dam failed, with the company arguing that a dam was impossible in a geologically unstable terrain with heavy rainfall. Scientific studies found the large amounts of contaminated sediments have changed the river’s ecosystem, with severe loss of fish, reports of death to riverside rainforests and areas along the river’s considerable flood plain. In passing the legislation, PM O’Neill declared to Parliament that the immunity granted to BHP Billiton marked “a very bad decision [by the then-PNG Government led by PM Mekere Morauta]…preventing its own people from exercising their right under law to sue for permanent damages done to their environment and their livelihood”. The PNG Government’s decisions raise substantial questions for mining companies, mine-affected communities and governments worldwide. All of whom continue to grapple with balancing the economic and social development possible through mining, and the industry’s negative environmental and social impacts. What, if any, ongoing protection should companies expect or receive when immunity deals are struck? Which individuals within mine-affected societies should contribute to decisions about when and how mining companies are held to account? Are agreements made with one era’s elected officials themselves immune to the attitudes and decisions of those who follow? The Ok Tedi case is particularly thorny. Despite the extraordinary environmental damage, Papua New Guinea of the late 1990s was a country struggling under enormous economic pressures, including ballooning interest and inflation rates blamed on years of gross mismanagement. Government services strained under the weight of economic failure, leaving many remote communities bereft. At the time of the 2001 agreement, BHP Billiton’s preference was for closure of Ok Tedi. Yet the mine comprised an estimated 11 per cent of GDP and produced 19 per cent of total exports. For a country in economic strife, the closure costs associated with such an asset were deemed too great, the environment another victim of national economic necessity. 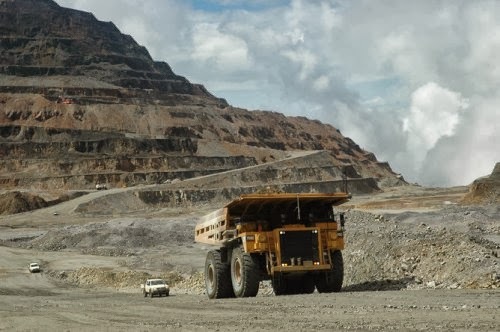 The reneging of legal immunity for Ok Tedi comes at a time when serious concerns are once again being raised about other PNG mining operations. The Panguna Mine in Bougainville, for example, holds the ongoing attention of international NGOs and local activists. Local communities are now fighting a potential reopening of the mine, which Jubilee Australia highlights as having a history of military-community conflicts. The continued operations of the Hidden Valley Morobe Joint Venture also garner ongoing attention from NGOs and activist groups worried about tribal conflicts, land disputes, environmental damage and insufficient compensation. The recent raising of Ok Tedi’s ghost highlights the pernicious nature of mining’s impacts and the ongoing requirements of redress and responsibility. Interestingly, the PNGSDP claims that the immunity granted to BHP Billiton also extended to the State as partial mine owner. Removal of the immunity does not only affect BHP, they argue, but the Government itself. The legal reality of this assertion has yet to play out or be investigated. Along with these questions, the case also reminds governments, especially those of developing nations, of the importance of foreign direct investment. Highlighting the tricky relationships between encouraging investment and protecting local societies and environments. In response to the legislative changes, BHP Billiton has warned the Government’s actions raise PNG’s ‘sovereign risk’. In other words, investors considering PNG as an option will now more carefully consider the levels of risk and uncertainty which may come with business commitments in PNG. Miners, governments, mine-affected communities and NGOs are monitoring the Ok Tedi case with great interest. It remains a terribly compelling, modern day example of the tensions between corporations, communities, government and the environment. And now a stark reminder that forgiveness or impunity once agreed may be reversible.